Cisco intensifies its commitment to the server market by enhancing its UCS technology. SAN JOSE, Calif. ( TheStreet) -- Cisco ( CSCO - Get Report) has strengthened its commitment to the server market by overhauling its controversial UCS technology. The networking giant sent shockwaves through the tech sector last year when it unveiled the Unified Computing System (UCS), its first foray into the server space. A threat to Cisco's longtime partner, Hewlett-Packard ( HPQ - Get Report), UCS eventually prompted the two companies to go their separate ways. Cisco is now ramping up this strategy, unveiling new blades and rack-mounted servers which the company says will significantly boost UCS networking capacity and compute power. "A single blade will now go up to 160-Gigabits of bandwidth, before, it was 40," said David Lawler, Cisco's vice president of UCS product marketing. "We will also have up to four times the compute capacity on the platform." Lawler told TheStreet that Cisco has doubled the number of Intel ( INTC Xeon processors on the blades and rack-mounted servers from two to four. The new Xeon processors also offer double the compute power of their predecessors, he added. Cisco also has enhanced the ASICs, or chips, used to provide UCS networking, according to Lawler, as well as implementing a new switch technology called FEX-Link. The Palo Alto, Calif.-based H-P is the 800-pound gorilla in the blade jungle, holding 52.4% of the market, according to tech research firm IDC, followed by IBM ( IBM - Get Report) who holds just over 28%. Cisco's UCS move was seen as an act of aggression. Clearly, though, the market represents a potential goldmine. IDC reports that during 2009, worldwide blade server revenue grew 2% year-over-year to $5.4 billion, the only major part of the server market to experience growth. Lawler told TheStreet that more than 400 customers have so far purchased the UCS. "This means more than 400 of the UCS devices have been sold," he added. Cisco acknowledged that UCS is in the "early stage of customer acceptance and pilots" during its recent second-quarter conference call, but said that orders increased more than 100% sequentially. 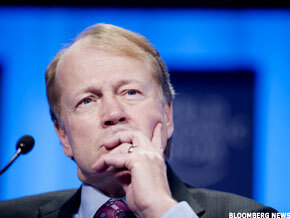 During the call, Cisco CEO John Chambers explained that the firm is "probably two quarters out" from having a "meaningful discussion" on its UCS business, which suggests that the technology could become material later this year. Cisco has been touting UCS as a foundation for users' virtualization efforts and is partnering with a number of companies, including VMware ( VMW, EMC ( EMC and BMC Software ( BMC around the technology. H-P, however, has hardly been sitting on its hands, bolstering its own ProCurve networking products and launching its BladeSystem Matrix, a direct competitor to the UCS. Last year H-P also forged a 10-year global alliance with telecom-equipment maker Alcatel-Lucent ( ALU and spent $2.7 billion to acquire Cisco rival 3Com ( COMS.